It’s been a bloodbath for the Lumad, the collective name for the indigenous peoples of the southern Philippines island of Mindanao. Dispatches: Palparan Arrest End of Aquino Apathy on Philippines Impunity? Philippine authorities did something extraordinary on Tuesday: in the early morning hours they arrested a former senior security forces official implicated in serious human rights violations. 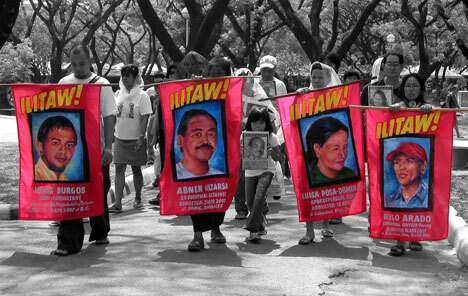 Enforced disappearances in the Philippines: A strategic shift against the Left? The Philippine Supreme Court today dismissed the rebellion cases against six leftist congressmen known as the “Batasan 6,” among them Anakpawis Rep. Crispin Beltran who has been detained in the past 15 months. “We are vindicated. This is a triumph of truth and justice over the Arroyo government’s invented and unfair charge against duly elected people’s representatives,” Bayan Muna Rep. Satur Ocampo said.